Teleporter is fully compatible with several RDBMS that have a JDBC driver: we successfully tested Teleporter with Oracle, SQLServer, MySQL, PostgreSQL and HyperSQL. Teleporter manages all the necessary type conversions between the different DBMSs and imports all your data as Graph in OrientDB. NOTE: This feature is available both for the OrientDB Enterprise Edition and the OrientDB Community Edition. But beware: in community edition you can migrate your source relational database but you cannot enjoy the synchronize feature, only available in the enterprise edition. Teleporter looks for the specific DBMS meta-data in order to perform a logical inference of the source DB schema for the building of a corresponding graph model. Eventually the data importing phase is performed. To learn more about the two different execution strategies click here. Teleporter is a tool written in Java, but can be used as a tool thanks to the teleporter.sh script (or .bat on Windows). admin, with default password "admin", has access to all functions without limitation. reader, with default password "reader", is the classic read-only user. The reader can read any records but can&apos;t modify or delete them and has no access to internal information such as users and roles, themselves. writer, with the default password "writer", is like the user reader but can also create, update, and delete records. For further informations about the Security of the OrientDB database click here. Source DB Schema Building: the source database schema is built by querying the source DB metadata. Graph Model Building: a correspondent and coherent Graph Model is built. 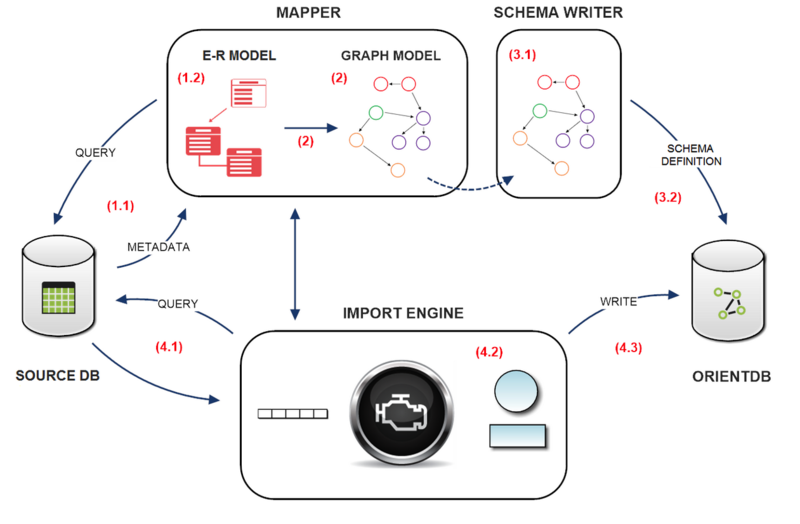 OrientDB Schema Writing: the OrientDB schema is written according to the Graph Model in memory. OrientDB importing: importing data from source database to OrientDB.